The New York Giants visit the Oakland Raiders in Week 13 of the 2017 NFL season. PFF previews the top player matchups of the game. 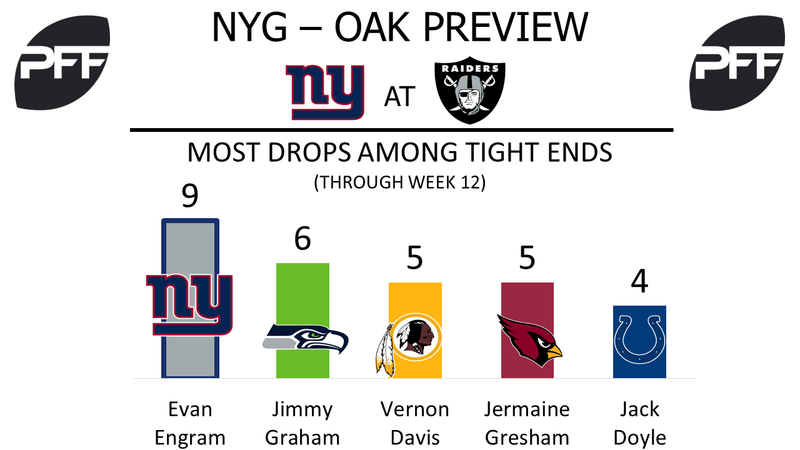 TE Evan Engram vs. LB NaVorro Bowman – Evan Engram continues to be one of the highest utilized tight ends in the league. He ranks second in targets with 79, and second in snaps in route with 364. Unfortunately, the high usage hasn’t always come with optimal results, as his nine drops lead the league among tight ends. His drop rate of 16.98 is the worst-rate among 38 qualifying tight ends. Engram has had issues with blocking, in particular run-blocking, where he currently ranks 70th among 73 qualifying tight ends with a run-block grade of 35.8. NaVorro Bowman has been targeted 13 times this season, allowing 11 receptions for 113 yards and a touchdown. He is one of the least-targeted linebackers in the league, as his 12.9 coverage snaps per target is the second-highest mark among linebackers. Bowman is allowing a reception every 15.3 coverage snaps, the second-best rate among linebackers. It will be interesting to see how the rookie fares against the veteran when they are matched up. T Chad Wheeler vs. Edge Khalil Mack – Chad Wheeler has allowed ten total pressures (three sacks) in Weeks 11 and 12 combined, tied for the most among offensive tackles. His pass-blocking efficiency of 87.9 is the third-lowest among guards in that span. Having a “down year” by his standards, Khalil Mack currently ranks fifth among 112 qualifying edge defenders with an overall grade of 91.2. He’s generated 51 total pressures, tied for seventh-most among all edge defenders. Wheeler will have to greatly improve upon his play to help give his new quarterback time in the pocket. QB Geno Smith vs. Raiders secondary – The 18th-overall graded quarterback in the league, Eli Manning, has been benched. Geno Smith will start in his place, and showed some potential this preseason. Unfortunately for the Giants, Smith hasn’t had much NFL success, as his highest-graded season came in 2015, where he finished with an overall grade of 72.4. He’ll face a trio of cornerbacks in T.J. Carrie (82.9 overall grade, 20th among 118 qualifying cornerbacks), Sean Smith (75.6 overall grade, 57th), and Dexter McDonald (74.2 overall grade, 61st). 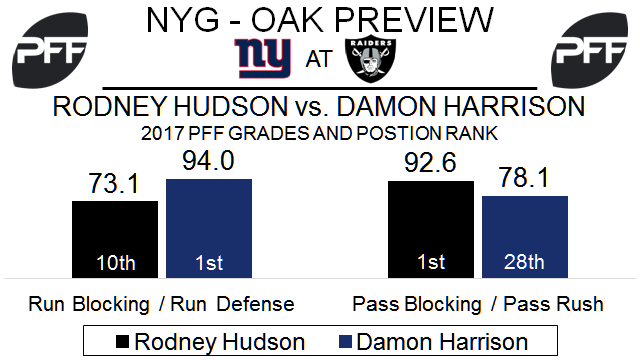 C Rodney Hudson vs. DI Damon Harrison – Harrison is questionable for the game with an elbow injury, but if he plays, this will be a great matchup between two of the best at their positions in the NFL. Hudson is PFF’s fifth-ranked center with an 80.7 overall grade this season. He leads all centers in PFF pass-blocking efficiency, having allowed only one pressure in 407 pass-block snaps. Hudson might have the advantage in the passing game, but Harrison has an edge in the run game. He is the fifth-ranked interior defender this year with a 90.6 overall grade and is first with a 94.0 run-defense grade. He is third among interior defenders with 25 run stops, after leading all defenders with 49 run stops in 2016. TE Jared Cook vs. S Landon Collins – Cook will likely see a lot of targets this week, with Michael Crabtree being suspended and Amari Cooper dealing with injuries. Cook’s 75.6 receiving grade is the eighth highest at tight end this season. His 32 targets from the slot are sixth most for a tight end, and his 271 yards receiving from the slot are fourth. Collins broke out in 2016, finishing the year as PFF’s second-ranked safety with a 92.5 overall grade. He is ranked sixth this season with an 88.5 overall grade. In coverage, Collins’ 0.85 yards per cover snap ranks 70th of 85 qualifying safeties. RB Marshawn Lynch vs. LB B.J. Goodson – Lynch came out of the Raiders bye week with his two best performances of the year in Weeks 11 and 12. He forced 10 missed tackles in 41 touches in those games, the fourth most of any running back over that span. For the year he’s the 10th-ranked running back with an 82.7 overall grade. Goodson should play this week after missing four games with an ankle injury. His 43.8 overall grade ranks 65th of 89 qualifying linebackers this season. Goodson has seven run stops in 102 snaps against the run and ranks 63rd at linebacker with a 6.9 run-stop percentage.